I definitely had an "a-ha" moment while shopping my stash this morning. 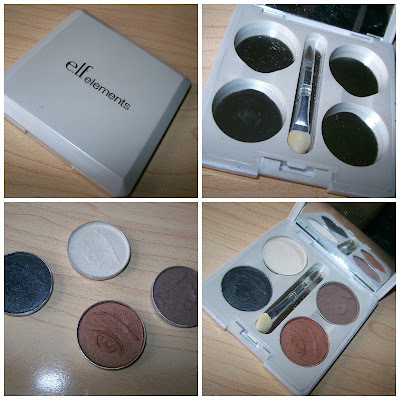 I forgot how much I LOVE these super affordable ELF Custom Eyes compacts. I remember when these first came out and you could get eyeshadows, lip colors, and cheek colors (each $1), and fill the empty quad ($1) however you wanted to. Well now it appears that only the eyeshadows are available this way- but they're still at the same really good price, and they've expanded the amount of colors that are available (as you can see from the screenshot above, taken from the ELF website). It was years ago when I first bought mine, and now I remember why I did. The shadows are really pigmented & nice quality. And the palettes could also store your MAC shadows, Coastal Scents hot pots, or anything else of that size! (A magnet on the back of the shadow pan is needed-- these ELF shadows come with magnets on the back). Again, you buy the palette separately for $1 (which has an excellent mirror inside), and it'll come with four empty spaces. Select whatever shadows you want (they'll come individually packaged), and then pop them into your palette! My palette is made up of some basic neutral/smokey shades. The swatches from left to right are Ivory, Moondust, Dusk, and Mocha. For this look (which I did very quickly), I just applied Ivory around the inner corner, Moondust all over the lid, Dusk in the outer corner, and blended Mocha as sort of a transition color just above the crease. Then I used Ivory again under the brow. I smudged Moondust on the lower lashline, and also added Dusk to the outer part of the lower lashline. I used a navy liquid liner on my upper lashline, black pencil liner in the waterline, and finished off with mascara on the top & bottom lashes, along with Salon Perfect Demi Wispies False Lashes. In case you were wondering, I'm wearing the Maybelline Color Whisper in Petal Rebel on my lips. There you go! The next time I order from ELF, I plan to pick up a few more of these shades. I can either get another ELF compact to put them in, or add them to a Z-palette! I've also run across these singles in Target, but I don't think they carry the full selection of shades. Have you tried the ELF Custom Eyes? Do you have any favorite colors? Cupcake has finally calmed down after her rampage around the living room. Got caught up on Sunday's Mad Men last night. If I had a dime for every time I exclaimed, "Geez Don!!" during that episode! Had a strange dream last night that was set back in the Mad Men era (1960's). I was waiting on an elevator and apparently it was my fault that the elevator was taking a really long time and I was getting yelled at and scowled at. Prior to that, I had a dream that I worked at Bath & Body Works, and it was my job to demonstrate the products in a bathtub in the middle of the store. Everyone else thought this was totally normal. I, however, was very embarrassed. LOL! These are beautiful shades and they pack such a punch! I'll have to pick up a few of these the next time I'm in target! Hi Emily- regarding the daily nuggets and Mad Men: what's up with Pete turning in to Don JR? And that fact that Don is cheating on Megan just has me beside myself. You are so right when you say Geez, Don!!! Make-up is great,Waiting on my blog. I would love to see you review the new Too Faced summer palette. I can't decide whether or not to spend the money. Shes got a few videos on it i think. At least one tutorial. Hope you can find it. Is the Dusk shade on the blue or grey side? 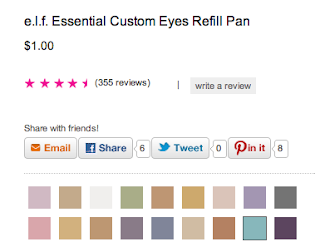 It looks a really dark blue on the pan but then translates into a more grey shade on the eye? Am I right? You're eyes always look absolutely stunning! I took out the plastic circle divider part (it popped right out) so i could put in any shape or sized depotted product i have. I have a few shades that i like and havent used in a while i guess i should rediscover it. Emily what are some good summer face products? Foundations that have coverage but arent heavy and dont break down? Maybe an overall blog or video for the upcoming season? Oh wait! I forgot to ask if you had seen swatches for the new duochrome summer collection for the colour tattoos?? Some look so pretty but i dont know how versitle they are. 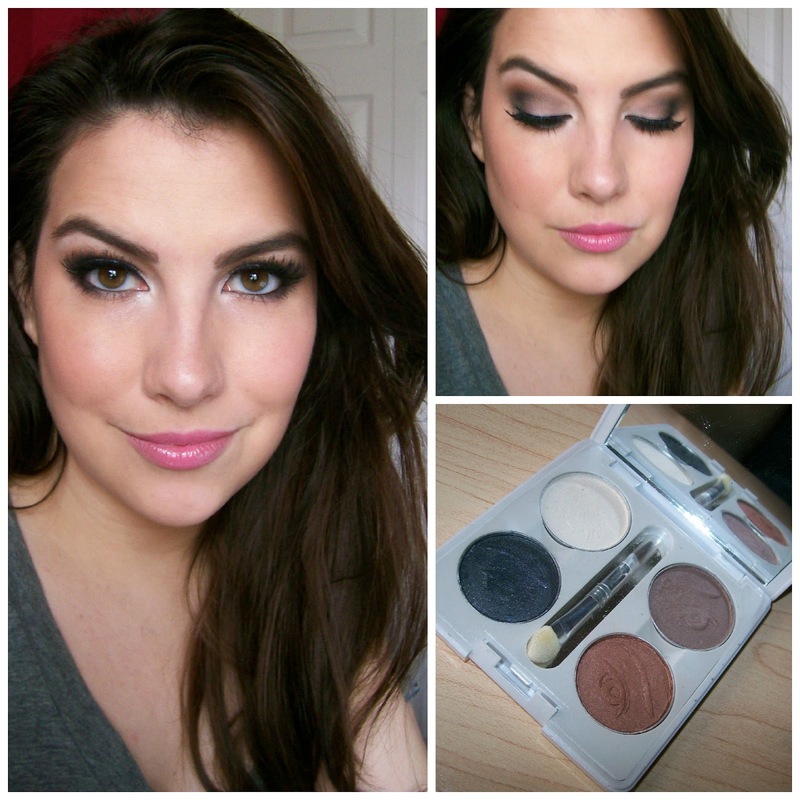 This look is exceptionally pretty on you, Emily! I was on eyeslipsface.com today and they have 50% gifts until 4/21. Make sure you look at all the gifts, particularly the different $ level gifts, b/c somethings that don't seem like gifts are still 50% off, like single mineral lipsticks. What a *gorgeous* look! It's amazing what looks you come up with! I have the E.L.F elements quad, but with different shadows. They were too chalky and not very pigmented. I wish I had my hands on the colors you have. Those colors are gorgeous! And when Don was sitting in the hallway at the end of the episode... like, what is he dissatisfied with now? Is his intelligent, supportive, beautiful wife too much of a drag? These pallets would be perfect if they came in bigger sizes too. Can you come to my house and teach me how to apply eye shadow? Your eyes always look amazing!!! I love these palettes,sο pigmented!!! this eye look is stunning on you! Gah!!! You are so gorgeous!!! Ha - hilarious dreams. Thanks for the ELF shadow recommendation. I'm going to give them a try! They look great on you! Hi Emily! I've been regularly watching your videos and, more recently, reading your blog for a few years now, and it always amazes me how you are always able to come up with new ideas, tips, and tricks to share with all of us. I love how creative and down-to-earth you’ve remained throughout your years of being a beauty guru. I really enjoyed hearing more about your life in the video “Q&A on TV News Jobs, YouTube & More.” It’s extremely inspiring how you’ve followed your passion in the beauty industry, even though it’s a big change from what you were doing previously. I appreciate your diligence in making affordable, inventive looks and searching for those “hidden gems” in the drugstore that deserve more recognition, rather than just reaching for the most expensive lipstick on the shelf. I still love the short segments of Cupcake in your videos. So cute! Keep up the great work Emily! nice collection of ear ring.